I have posted earlier about several movements that are using religion (in this case - Islam) to teach and practice environmentalism. For example, check out this post from a few months ago: Green Muslims. Now PRI has a story about an island off the eastern coast of Africa, where its inhabitants are using Islam to foster better environmental habits. I think a green movement within Islam has a real potential of taking off, and apart from a good PR move, it may also have a good, positive impact on the climate. But there is one thing I found fascinating in this story: The locals on the island were suspicious when the environmental message was seen as coming from the "west". They suspected a hidden agenda associated with it. However, when it was reframed as something already in the Qur'an, then the support went up. Well, this is something we worry about scientific concepts as well - especially for something like biological evolution. When Muslim scholars accept evolution, they often appropriate the concept and either assign it to medieval Muslim scholars of the 12th and 13th centuries or find supporting verses in the Qur'an. While there are problems with these approaches, perhaps another way would be to highlight the works of Muslim evolutionary biologists & paleontologists, as well as pointing to important evolutionary discoveries on the territories belonging to Muslim countries - such as the recently discovered primate fossil from Saudi Arabia. Green is the color commonly associated with Islam and some scholars say the Koran also commands Muslims to be green in the modern environmental sense. In East Africa, a development project using Islamic ethics has taught locals the Koranic imperatives of conserving natural resources. Some say eco-Islam has taken root. 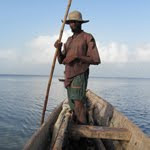 From Pemba Island in Tanzania, Matthew Brunwasser reports. While I do share your concerns about attributing Qur'an as a source for scientific knowledge or in general mixing religious sources and methodologies to scientific inquiry and understanding of the scientific inquiry, I beg to differ on this one for this very particular reason: environmentalism isn't a completely scientific topic of interest. In truth, while it gains information from science about the past, current, and possible future states of our world and nature, and how to help our nature; it is a social, cultural and most of all ethical advocacy of preservation of the nature - it is simply beyond being "only" scientific. In this aspect, I think it is very, very important to be able to comparatively study different religions, philosophies and beliefs with their attitude to nature - they are after all concerned with what is "right" and "wrong", the ethics, society, and culture. It's far more helpful to see how Islam provides green inspirations for a Muslim community than say to carbon-copy an example Western environmentalism; because it would probably fit better to their own understanding of every day life and nature as well as the needs and habits of their own society. Environmentalism, because of its social, ethical, and cultural aspects, isn't a singular entity and can be very plural. So as long as they don't go saying "drilling is eco-friendly according to Qur'an", there's only benefit in looking at different beliefs for inspiration on matters of social, cultural, and ethical interest, such as environmentalism. I actually completely agree with you. I think I confused the matter with making a comment about evolution. But yes, just like the alliance between Evangelical Christians and environmentalists in the US, religious motivations can play a powerful and useful role for Muslim environmentalism. Also check out Green Muslims.